As I was clicking through a file with older articles I’d written years ago, I found this little gem with 7 copywriting tips! it is still just as relevant as it was 9 years ago. So, in celebration of Marketing Words’ 20th anniversary this year, I’ve tweaked it (just a bit), added a little new material so you can learn copywriting tips from this classic blog post. I was just sitting here at my computer (as usual) when my husband walked in and announced, “There’s a man here to see you.” What? I wasn’t expecting anyone. “Who is it,” I asked. “Some guy who wants to speak with my wife.” My husband was home so I knew I was safe. I ventured outside to see who it was. Copywriting Tip #1 – Give your customers something absolutely free of charge. This makes them appreciative and brings about a feeling of good will. Just to clarify, this copywriting tip doesn’t mean you need to offer something free on the same page where sales take place. In some cases you will (such as a bonus with purchase), but not always. However, from time to time, you do want to show a little generosity toward your prospects. He began to pull box after box from the back of his SUV. As he approached my door, loaded for bear, he asked if I would allow him to vacuum and clean my carpets… all free, of course. At first I was going to turn him down cold. I wasn’t in the vacuum or carpet cleaner buying mood. 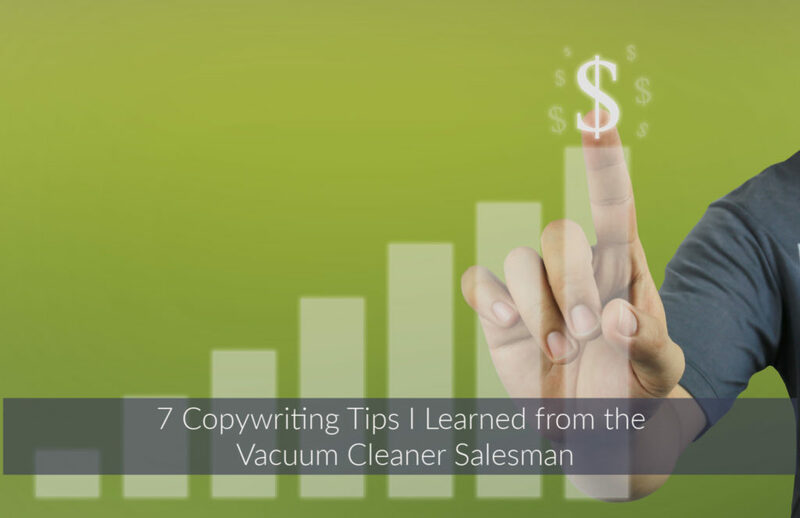 But then I wondered if I might be able to learn copywriting tips from this representative of one of the most successful vacuum cleaner companies in America. I decided to give in and allow the demonstration. As he walked into the living room, he began to set up the vacuum. Small talk followed. He complimented me on the interior design of my house, asked what brand of vacuum I used, how I liked it, how old it was, if I had considered buying a new vacuum, if anyone in my family suffered from allergies, and how much time I spent cleaning house. Copywriting Tip #2 – Get to know your target audience. By collecting this information, the salesman was mentally tailoring his “pitch” to suit me. He was making notes to include the elements of his presentation that would appeal to me personally, and leave out those that would not. You must do the same in your copy in order to effectively reach out to your customers. Next, the Kirby man (who I’ll call Roger), began to ask me questions that I would obviously have to say “yes” to. This is reminiscent of the Dale Carnegie style. Roger asked, “Would you like to be able to spend less time cleaning with better results?” He asked, “Would you like to know that the allergens AND the dirt are taken out of your upholstery and carpeting?” And finally, he asked, “Would you like for your new carpet to last twice as long?” Needless-to-say, the answer to all three was “yes”. Copywriting Tip #3 – Get them in the habit of saying “yes.” Dale Carnegie made a point of this in his book How to Win Friends and Influence People. 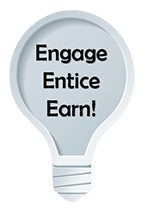 If you get someone in the habit of saying “yes” they’ll be more likely to agree with you when it comes to other questions like, “Are you ready to buy a new vacuum!” You don’t have to hammer site visitors with questions, however. Strike a balance between training them to say, “yes” and interrogation. Roger asked me to get my old vacuum from the closet. I did. He asked me to bring him a box of salt. (Yes, I saw it coming but I did it anyway.) He began to pour the salt onto my carpet. Then (as expected) he ground it in with his foot. He took my old vacuum and asked me to let him know when I thought it had sucked up all the salt. The motor began to whir and the challenge was on! After about 15 passes, I instructed Roger to stop. He did. Then he reached behind him and rolled over the Kirby G6 – Limited Edition. He opened the compartment where the output bag is stored and placed a black, thin pad over it. Next, he flipped on the “onboard transmission,” put the vacuum into “drive” and began to vacuum the same area he’d just cleaned with my machine. Just six passes later, he stopped the Kirby, opened the bag latch and pulled out the black pad. It was covered with salt! It was also covered with dirt, sand, lint, and hair. It was extremely gross, not to mention embarrassing! Copywriting Tip #4 – Prove your point. Just telling someone that a product or service works means nothing. You have to prove that you can and will do what you say. If you can’t offer an online demonstration, use testimonials, social proof or other references. You might also give a free trial period (for software, tools, etc.) so the customer can evaluate the product/service themselves. “I know you’re busy, ma’am, but I just wanted to show you that. I’ll finish vacuuming now and then clean your living room,” said Roger. I knew Roger and I weren’t finished yet but I went back to my computer like a good little prospect and let him do his work. I continued banging on my keyboard until I heard the whirring of the motor stop. Roger peeked around the corner and told me it would take an hour or so for the carpet to dry enough to walk on. “Do you mind if I get my gear together in here?” I agreed. As he was putting up hoses and attachments, he began to explain the extreme versatility of the Kirby G6 – Limited Edition. The package he had with him that day came with a base vacuum which offered an “onboard transmission” so the motor wouldn’t wear out. It also made the vacuum easier to push. It offered the ability to blow as well as pull suction. This, as Roger explained, was useful for inflating pool toys or balls – and for deflating air mattresses, etc. so they would lie completely flat for storage. The carpet cleaner attachment would… Well, you get the idea. Copywriting Tip #6 – Focus on benefits, not features. We’ve all heard the phrase before, however most don’t apply it. I wouldn’t care anything in the world about a vacuum with “onboard transmission” because I don’t have a clue what it is or what it does for me. Once explained, however, I love the idea of a vacuum that drives itself. Lastly, after the full tour of how easy the vacuum was to operate, how much cleaner my house would be with less effort, and how versatile the vacuum/carpet cleaner was… we got to the price. Needless-to-say, with Kirby’s reputation, I was expecting to pay and arm and a leg. However, Roger simply said, “All this can be yours for just $3.00 per day.” That didn’t sound so bad. “For how many days,” I smirked. Roger laughed and pulled out his pricing sheet. To answer the question you’ve had since the beginning of the article… yes, I bought the vacuum. Copywriting Tip #7 – Save the price for last (much of the time). While #7 is not always applicable, it’s a good practice to get customers to love your product or service and then – if possible – break the price out into as small an increment as you can. This saves the prospective customer from suffering “sticker shock” and makes the item appear more affordable. With that said, look at the world’s biggest online marketplace, Amazon.com, and you’ll see that they list the prices right up front. How do you choose? Test! Was it worth it? Yes. It was worth my time to find out how one of the most successful vacuum cleaner companies in America does its sales magic. I learned a lot from the vacuum cleaner man, and my house looks great! Have questions about these or other copywriting tips? Talk to me below! Yes! Classic examples worth a reminder. Karon, this may be an oldie, but it’s a goodie! These are great tips and an excellent example. I remember years ago when I was a child and my mother ended up purchasing in-home from a vacuum salesman (not Kirby). I’m sure he used many of these same tactics – because they work! Thanks for sharing and congrats on your anniversary. Thank you, Randy! Yes, I think most of them were trained in a similar way. I appreciate your well wishes.